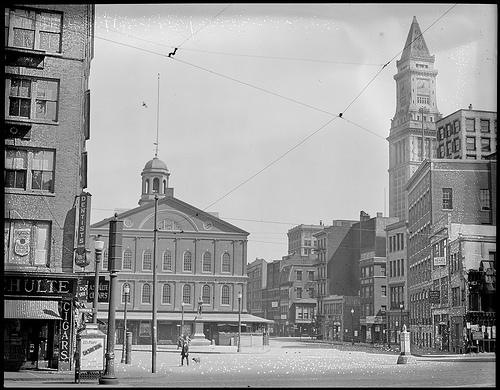 Dock Square/Faneuil Hall, as viewed from Adams Square in the 1920s. A foot tour of Boston's Freedom Trail from a perspective of urban development and urban renewal. The tour will focus upon the urban evolution of Boston as a city, from the city's founding in 1630 on an isolated peninsula to the connected, densely-populated metropolis Boston is today. If you look closely, Downtown Boston is a quirky place. Buildings dating back to around 1700 stand in front of brutalist concrete structures built in the mid-1960s. Skyscrapers stand beside narrow, tenement-style buildings. Large open spaces suddenly appear at the center of the most densely-populated neighborhoods. Small hills stand in the middle of flat land. Why is Boston's structure and development so inconsistent? Find out on my Freedom Trail tour, a Freedom Trail like no other. The Freedom Trail route, with its rich history and stops in a variety of neighborhoods developed (or redeveloped) at a range of times throughout Boston's history, is an ideal route to show Boston's development process. This tour will focus upon the less-appreciated landmarks along the Freedom Trail, and with those landmarks will show the extent to which Boston has evolved over time in response to advances in technology and nationwide urban trends. Take this tour and see the Freedom Trail's overlooked significance as a walk through urban development history. After this tour, you will never look at the Freedom Trail the same again. The tour begins at the Boston Common Visitor Center, on Tremont Street by the Park Street T Stop. The tour follows the Freedom Trail route, ending by the USS Constitution Museum, a 10 minute scenic ferry ride across Boston Harbor to Aquarium Station/Long Wharf on the T's Blue Line. The ferry costs $1.70 per person. The tour will last 90-120 minutes.